It's been several weeks since I reported that a major construction project will commence this summer on I-694 between I-35W and Hwy. 252. On Wednesday, representatives from MnDOT will show off plans for the $21 million project and talk about how lane closings and the construction will impact area residents and businesses. The meeting will be held from 4 to 7 p.m. at the Fridley Community Center, 6085 7th Street. A major road rebuilding project on Interstate 694 will drive north-suburban commuters to distraction this summer and fall. From June through October, the Minnesota Department of Transportation will give the 5 1/2-mile stretch between Interstate 35W in Arden Hills to Humboldt Avenue in Brooklyn Center a $21 million makeover that includes concrete repair, resurfacing and replacing three bridge decks. The project will reduce the freeway to two lanes in each direction during the day and to a single lane overnight. On three weekends, the entire intersection of I-35W and I-694 will be shut down. Rife with crumbling concrete, potholes and culverts in disrepair, the highway had been scheduled for an upgrade in 2017. But when federal funding covering 90 percent of the cost recently became available, MnDOT moved the project up four years. "We know this will cause backups. We know this will cause delays," said MnDOT spokesman Kent Barnard. "People are not going to appreciate this, but we have to get this work done. When it's done, it will be smoother, safer and bring better mobility through the corridor." Complicating matters for motorists is that the new work on 694 includes both sides of the Mississippi River, meaning there are few viable options in the area for drivers who need to cross it. The two nearest major crossings are Hwy. 610 several miles to the north and Interstate 94 in downtown Minneapolis to the south. "This will have a fairly substantial impact on traffic," Barnard said. "People should start looking at different ways to get around." MnDOT has not ironed out all the details yet, but the department is expected to have a design in place by the end of this week, Barnard said. In upcoming weeks, MnDOT plans to send out more than 15,000 post cards to businesses and residences on East River Road, Central and University Avenues NE. that are within two miles of either side of 694 to notify them of the construction period. And since it's a major regional corridor, Barnard said, notices also are being sent to trucking associations and neighboring state transportation agencies. Locally, MnDOT also will host a community meeting March 6 at the Fridley Community Center. Already Medtronic, whose headquarters is off Central Avenue NE. and 694, is asking MnDOT to hold information sessions for its employees. Ramps at Silver Lake Road, Central and University Avenues and East River Road will be closed at various times during construction, but not at the same time, Barnard said. The biggest choke point is likely to be at Hwy. 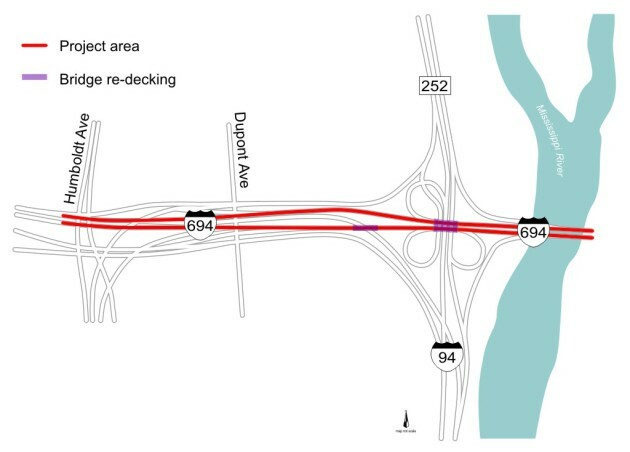 252, where three bridge decks on eastbound and westbound 694 will be replaced. Adding to the potential headaches is that work will continue to the east of 35W as MnDOT finishes reconstruction of the interchanges at Hwy. 10 and Hamline and Snelling Avenues. In April, Hwy. 10 will be shut down in both directions from 35W to 694 and a new interchange will be built at Hwy. 96. In the south metro, drivers on I-35E and I-35 will see their share of cones and barrels, too. A portion of 35E from County Road 42 to I-35 will be closed for as long as a month in May, and traffic on I-35E and I-35 through Eagan, Burnsville and Lakeville will be reduced to a single lane for much of the summer as part of a major resurfacing and bridge repair project that will affect 17 miles of freeway.